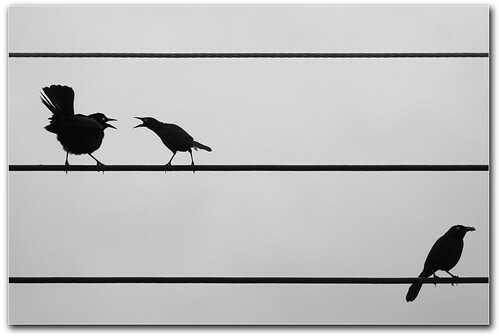 UPDATE June 19, 2013 Since twitter has killed their version 1 API, there is no longer a public RSS feed provided for twitter activity. Expect new solutions to emerge, one that is usable now is this method from labnol to convert the new JSON feeds to RSS using a Google Script. This method works in FeedWordpress. I’m growing more and more and more and more (more?) interested in building out more syndication architectures like we have done in ds106, at a range of scales from te 600 feeds we crunch for ds106 to the 40 or so we did for the Project Community Class down to the 2 I do for my own self syndication. Leaning towards the bigger end, I have been working to set this up for the ETMOOC thing Alec Couros (and about 90 other people it seems) are launching soon. It’s been a great chance to stretch some WordPress chops with FeedWordPress in place for the syndication engine. The ETMOOC site itself is set up as a WordPress multisite (using directory structure for additional blogs). The main site is set up with a basic Twenty Eleven theme with a big bold header. 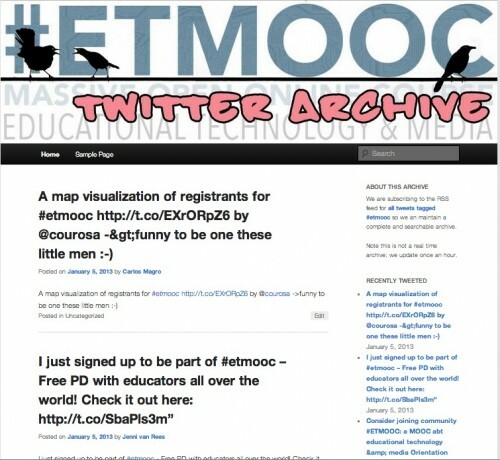 I have set up two additional sites, one the Hub or syndication of participant blogs (I’ll write ore on that one later), and the one I just tinkered with yesterday set up as a site to archive the tweets tagged #etmooc. 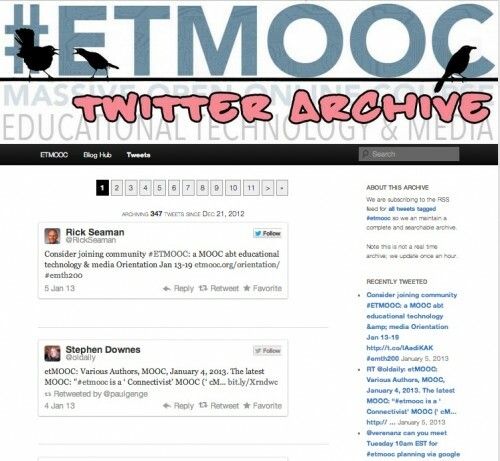 I enabled the Feedwordpress plugin; it is really just being used for one feed for the twitter search result on #etmooc. For more on this see The Socialable How to get your Twitter RSS feed using this simple hack. My first idea was to try the WordPress P2 Theme which made for a slightly better output, but I could see confusion as theme is really meant to build a twitter like environment in WordPress (which is neat and useful) but mixes things up as it has a post box at the top. Plus, the icons would be blank as they represent the faux user accounts Feedwordpress creates. I thought about doing some theme hacking, but it seemed to make for a more cohesive site to make a mod of the Twenty Eleven theme on the main site. It would be basically just using for output the title of the RSS feed, since that is the tweet, and maybe parsing out the twitter user name to make a link. But it was when I was out for a walk yesterday that the idea sprung on me- that was both easier coding and a better output. You see in the recent versions of WordPress, they have built in a series of automatic embed technology, so if you just put a URL on a blank line for a flickr page, or a youtube page, or in our case, a single tweet’s URL– wordpress will automatically turn that into an embedded media when published. So here is the thing, the URL for every tweet we get arrives in RSS as the link value, and when published via Feedwordpress is technically the permalink url for the post. My light bulb was I just had to rewrite the wordpress loop to just use that and the function that does the embed (the capability can be called from PHP). Any time I do a mod of a WordPress theme, I set it up via the approach of CHild Theming. This means I make a new theme that just overlays tiny changes on the “parent” theme, but I never edit those files. Ideally this helps if themes get updated, as you can just update the parent, and thecghild inherits the changes. In practice, I cannot say I have ever had an issue where a theme stopped working and required updating. The theme I use on this blog is at least 4 years old. It is however, just better code practice to theme in this manner, Especially as I am going to have to make two versions for each of the sites I use. The name here listed for Templat is important as it identifies the parent theme by name, as is the @import statement which just says “load all of the CSS from the parent”). This means your site gets all the style sheet info from the main theme. Any CSS you add can override to augment this CSS, so you just put what styles are different. The screenshot.png (a 320px wide PNG) file is handy so it provides a preview in the theme viewer area. Now the real beauty comes in when you decide you need to modify a theme file, say a footer template or a page template. You just make a copy of that from the parent theme directory, five it the same name in the child directory, and it replaces the original. So instead of editing the core theme files, you make modified copies. I don’t know about you, but to me that is genius. Basically, the only thing output is tossing the permalink (which is the link to the tweet) into the wp_oembed_get() function and echoing the output. I came up with one more modification- we are going to collect thousands of tweets, and to make it easier to go page back in time, it helps to change the default navigation from “previous/next” to something that allows you to access any set of ten tweets via paged navigation. I installed the Prime Strategy Page Navi plugin, and added the extra CSS it needs to my child theme’s CSS. I changed some of the CSS to make the selected page black background, and the hover class to be a bit more obvious. The CSS class allows me to do some styling. It looks good, but now I see problems. You see FeedWordpress by default refreshes once an hour. If there are more than 20 tweets per hour, we will miss some. For now I am cutting the time to every 10 minutes, which is technically a bit abusive of RSS requests. In the long run, fetching tweets by RSS is doable for a medium or low activity search, but #etmooc is going to have hundreds of tweets. I’m thinking for an improvement O might have to figure out how to access the twitter API directly, where I can fetch up to 1500 at a time. In the meantine, I have set up the amazing tool created by Martin Hawksey to archive tweets in a Google Spreadsheet. His genius is that it updates itself, and there are bult in tools to summarize and generate visualizations of the twitter activity. I have a copy of that spreadsheet running now for ETMOOC. I am thinking an easy way to populate the Twitter archive site is just to update from the data in that spreadsheet, e.g. publishing the summary as a CSV, and parsing that for new tweet URLs. Really interested to see where you go with this one. Something that occurred to me was categorising the tweets when imported. You could just extract any additional tags in the tweet or maybe go a bit further and categorising tweets containing ‘?’ as questions. Another thing to be aware of is Twitter is killing RSS access in March as part of their new API (I’m sure a number of API 1.1 to RSS solutions will popup). One last thought was where you could use the spreadsheet as a way to feed wordpress. Maybe croning somthing like the CSV importer plugin http://wordpress.org/extend/plugins/csv-importer/ ? Brilliant gems are your ideas (as usual), Martin, thanks. The tweets archive is not really meant to replace the functionality of your spreadsheet, its more of a public facing interface to work with the web site. I see both working together. I pondered the idea of turning twitter hashtags into wordpress tags; I think it would be easy with a WP filter on publishing. The question idea is interesting; I guess we could also marked with ;-) as “whimsy”? I really did not see RSS as the best vehicle for grabbing the tweets (it will likely fail when the stream gets very active), it was a first step in. The thing with importing the CSV is that its going to keep growing in time; I can see making a new sheet that constructs the CSV headings that that plugin can use. I am not sure how that importer works with duplicate content. I could see a PHP script that marches down the spreadsheet public published as CSV, and processing down until it hits a tweet it has already processed (matching on something like date or maybe the id). Or I might try the python script tony shared to at least pull down the tweets as local data, and make another script to process. I had a look at hooking a XML-RPC call to the spreadsheet script to push new tweets but didn’t get very far. Might revisit. Thanks Bruno for sharing your Open Chat Directory, that’s a nifty service to recommend. I found this post hoping from posts to post on a long trail this morning. I read your posts on static web publishing, read the work of Dave Winer, the Google app to collect twitter statements afterward. Catching up old #etmooc is surely possible but tricky, not sure it’s worth it. Should one update olds posts? My take is yes because we change our perspectives, learned more and reached more comprehensive conclusions. I asked the question on twitter two weeks ago and add different responses. The historic view has also its benefit, if only for learning lessons and this could be one. All the services are free but this is apparent only. We pay by giving away our contents, our data, our attention. Based on this I pested against Twitter but they are on their strict rights. They started to warn that search may not be reliable (return all tweets), and streaming will only be a sampling. Again they are on their rights. Free and public services are two different things. It’s very annoying, but we should be aware of it, a bit prepared. Sadly RSS will soon be a thing of the past. It’s going to be slowly changed to json. More compact, faster to read, native in many languages. Twitter just anticipated it, as did GoogleReader. For them weeding features is a matter of saving server time (energy) and support overload.